When you create a new profile or set up a new computer, you'll want to access your old email in Outlook. While you can use the File, Import and Export menu, we don't recommend it – you'll lose any custom forms or custom views you might have, along with a few other things. 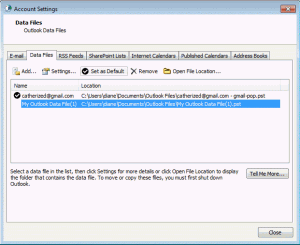 There are two ways to add an existing data file to a profile in Outlook 2010. When you add accounts to your profile you can select the data file to use. 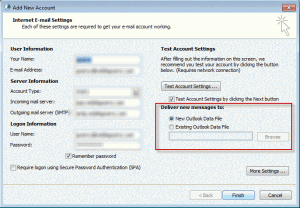 Or, you can add the data file later, either from the Account Settings dialog in Outlook or using the Control panel, Mail applet to edit the profile while Outlook is closed. 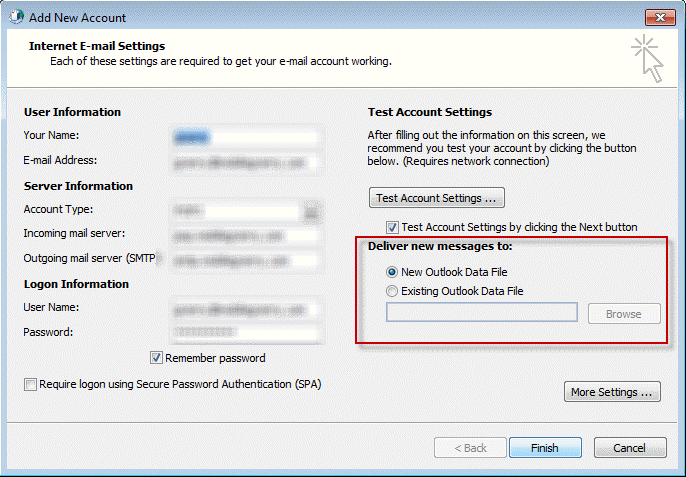 In Outlook 2010, you can choose a different pst file after Outlook automatically creates the account. After the wizard has finished, select the option to Manually configure the account (in the lower left corner) then click Next. Sorry, this is not available in Outlook 2007. Browse to your old pst file and complete the wizard. Open Control Panel and use search to find the Mail applet or switch to icon view and look for it. In 64-bit Windows, it's called Mail (32-bit). If you have more than one profile, select the Show Profiles button. Select your new profile from the Mail dialog and choose Properties, then Email Accounts and finally, View or change email accounts. Click the Add button on the left of the dialog (highlighted in the screenshot below). Don't let this dialog confuse you, even though this appears to be only for creating new personal data stores (PST). You can use it to browse for an existing PST. 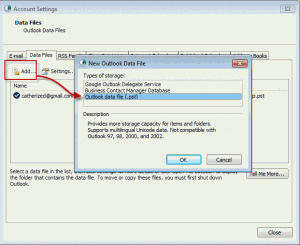 Click Ok on the New Outlook Data File dialog, leaving the default selection selected. Browse to find your existing PST and select it, then press OK to add it to the profile. To set your existing PST as the default delivery location, select the PST you just added and click the Set as Default button. This will add a black check mark icon next to it in the list. If Outlook is open, when you press Finish you'll be reminded that this won't take effect until you close and reopen Outlook. To remove the PST from your profile, select the data store you wish to remove from your profile and click the Remove button. Tip: If you have mail in the data file you want to remove, you can use File, Import (or File, Open, Import in Outlook 2010) after you start Outlook. If you decide to leave this data file in the profile, you can right click on it in Outlook's folder list and choose Close to remove it at any time. you can also return to this screen using Tools, Account Settings (Outlook 2007) or File, Account settings (Outlook 2010) to remove the data store. Note: when you remove a data store from your profile, it is not deleted from your hard disk. The same is true for profiles: when you delete a profile, the associated data files are left on the hard drive. What type of email account? This only works with POP3. IMAP, Outlook.com, and Exchange need to create their own data files.